On 6 November 1951 Torsk returned to the Portsmouth Navy Yard for conversion to a Fleet Snorkel submarine. The snorkel, developed by the German Navy, is a long tube that can be extended above the submarine allowing her to take in fresh air for the diesel engines. This means she can run submerged on diesel power making greater speed than if she used the batteries to run her electric motors. She can also charge her batteries while submerged, thus extending her time below the surface from approximately 24 hours to several days. As part of the conversion, she received a streamlined “sail” that contains the snorkel intake and exhaust masts, as well as the periscopes and various radar and radio antennae. 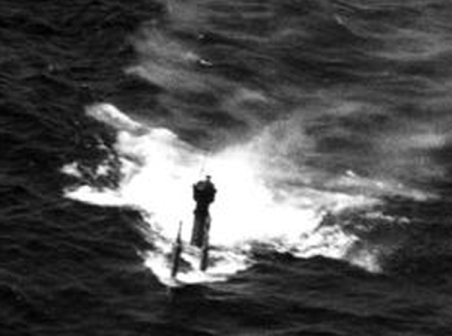 In the photo below of Torsk starting a dive, you can see the snorkel in the raised position at the rear of the sail (to the left in the image). The snorkel actually consists of two masts - the taller intake mast and the shorter exhaust mast with a flat "diffuser plate" at the top. The second photo below shows Torsk running submerged on the snorkel, coming towards the camera. The intake mast can be seen above the surface, with the exhaust just below. The diffuser plate helps to spread the exhaust bubbles under the water surface, as seen in this image (courtesy of Charles Weaver).